l’Hydroptère DCNS is the world's fastest trimaran. Image courtesy of Christophe Launay. The three-hulled trimaran can fly five meters above the surface of the water, Image courtesy of Thomas Lesage. Jacques Vincent and Alain Thébault, the boat's co-skippers. Image courtesy of Thomas Lesage. l’Hydroptère is a hydrofoil-based experimental trimaran designed by Alain Thébault, a French yachtsman who is also the boat’s captain. She officially became the world’s fastest sailboat in November 2009, by breaking the outright nautical mile record. Approved by World Speed Record Council (WSRC), she recorded an average speed of 50.17kt over one nautical mile. The boat’s name ‘l’Hydroptère’ was derived from two Greek words: hydro and pteron, which mean water and wing respectively. In January 2012, DCNS, a French naval defence company and one of Europe’s leading shipbuilders, became the ship’s sponsor and consequently her name was changed to l’Hydroptère DCNS. In August 2012, the sailboat arrived in San Francisco Bay to participate in America’s Cup World Series race. "l’Hydroptère is a hydrofoil-based experimental trimaran designed by Alain Thébault, a French yachtsman who is also the boat’s captain." The conceptualisation of l’Hydroptère dates back to 1975 when late Éric Tabarly (July 1931 – June 1998), a famous French yachtsman and an officer in the French navy, was told about viability of such a project. In 1983, Alain Thébault took over the project. With Éric Tabarly’s guidance, he was able to build a model of the boat in 1985 and sailed it on the Grand Canal at the Château of Versailles, France. In 1992, Alain was able to get support from DCNS, Aérospatiale, Dassault and the Chantiers de l’Atlantique shipyard. They all decided to become a part of the project. Construction of the boat commenced in 1993, with DCNS manufacturing the hull. It was completed in 1994 and in her maiden flight, l’Hydroptère was able to achieve a speed of 28kt. The ship was taken out of action in 1998 after one of her hydrofoils was torn away. The incident occurred when she was trying to break the speed record for 24 hours. She returned to the water two years later after being fitted with a new hydrofoil. She was also armed with a 3D flight simulator. The l’Hydroptère DCNS project was made possible by combining aeronautical and marine techniques. The three-hulled trimaran can fly five meters above the surface of water. In flight mode, the boat’s contact area with water is reduced to 2.5m2. 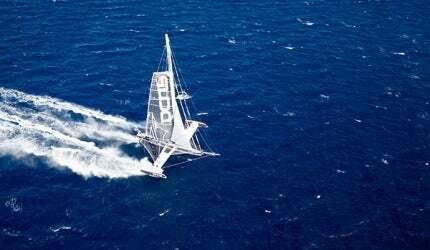 "She officially became the world’s fastest sailboat in November 2009, by breaking the outright nautical mile record with an average speed of 50.17kt." The boat’s take off is attained by her hydrofoils, which are fitted underneath each of the outrigger hulls. These are angled at 45° in water and give an upward thrust as soon as the boat reaches 10kt speed. The thrust that makes the ship to rise above the surface of water is produced due the difference in pressure between the upper and lower surfaces of the foil. The lift increases with the increase in speed. The ship can reach a speed of 45kt from 20kt in ten seconds. The ship’s hydrofoils or wings are made of titanium coated carbon fibre to make them stand against powerful stresses. The boat’s optimised shape, which was attained by applying aerodynamic principles, ensures that she gets maximum efficiency from her sails and at the same time keeps the wind-resistance to a minimum. Adastra is a trimaran-type superyacht built by McConaghy Boats for Hong Kong-based shipping baron Anto Marden. The 42.5m (140ft) superyacht has been designed by UK-based John Shuttleworth Yacht Designs. The overall length of the boat is 22.48m. The beam is 24m and draft (while in water) is 3.5m. The ship’s draft is reduced to 2m while flying. The length of outrigger hulls is 6.7m, while the length of each hydrofoil is 5.7m. The boat’s weight is 7.5t. The mast is 28m tall. Gennaker area and mainsail area of the sails are respectively 315m2 and 185m2 in size. The trimaran requires about 12kt of stabilised speed to take off. Her speed is approximately two times that of wind; in other words the boat cruises at 30kt with 15kt of established speed. Maximum speed of the boat is 56kt and maximum average speed on one nautical mile is 50.17kt. Van Peteghem Lauriot-Prévost (VPLP), a French naval architectural company, and HDS were the main architects of l’Hydroptère DCNS. The central hull of the boat was manufactured by DCNS Lorient, while floats and crossbeams were built by shipyards Decision and Airbus Nantes respectively. Foils and rudder were built by B & B and Airbus Nantes, and mast by Lorimat. Strain absorbers were provided by Legrand & Revigny.